Proc. Roy. Soc. Edinburgh 11: 505 1882. 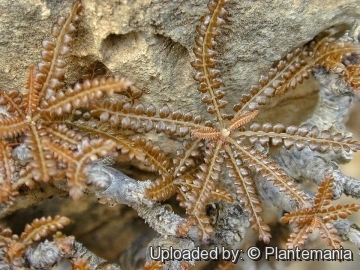 Origin and Habitat: Boswellia socotrana is a rare species endemic to Socotra, with a very limited area of occupancy. Altitude range: 50–600 metres above sea level. Habitat and Ecology: This species is scattered in dry, semi-deciduous woodland, and less commonly in Croton socotranus shrubland primarily on the coastal plain of the island. It is also associated with ancient stone terraces on the island. Several populations show no sign of regeneration suggesting a decline in the quality of habitat due to the influence of the grazing, combined with changes in the farming and growth of the human population on the island. Moreover, a change in climate, whether global or local, plays its certain role as well, and it is caused by an extensive disruption of vegetative cover. In Socotra there are seven species of Boswellia but only Boswellia socotrana is tapped locally for its gum but not at a commercial level. Description: Boswellia socotrana is a ground-rooted tree, readily distinguished from all other boswellias on the island by the small leaves which have winged stalks and numerous, small leaflets and the inconspicuous pale greenish-yellow flowers which are borne in short, sparse panicles. 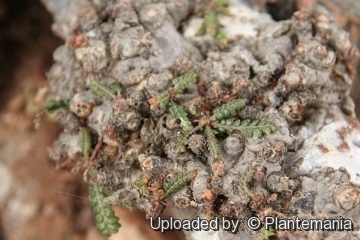 Boswellia socotrana appears as a vertically spreading shrub or small tree depending on growing condition. The tree can be quite variable in its look. Stem: The trunk forks low in its tree-like form. In fact, it often looks like two trees growing out of one tree stump. Stiff branches may begin quite low on the woody plant's shrubby variety or more than half way up the trunk on its tree-like variety and often awkwardly contorted. As a tree, the trunk may measure just under 30 in diameter and mature to a height of 7.5 meters. The flaking, peeling bark begins life as reddish brown in colour and mellows to grey with age. Leaves: The, leaves actually are Made up of many miniature paddle-like, curly or indented leaflets on winged stalks. Several morphotypes with glossy dark evergreen, grey-green, or coppery green leaves were recognised. The leaflets grow in pairs on opposite sides of a foliar axis. The particular compound growth arrangement is called imparipinnate. The foliar line-up therefore produces an odd number of leaflets such that just one leaflet grows at the end of each set of compound leaves. Flowers: Small borne on the ends of short spikes (panicles), few in number, geranium-like in shape, and greenish-yellow or reddish. Each flower has five variable petals which may be either oblong or ovate. Fruits (drupes): About the shape and size of a marble. 2) Miller, A. 2004. Boswellia socotrana. The IUCN Red List of Threatened Species 2004: e.T30416A9546843. http://dx.doi.org/10.2305/IUCN.UK.2004.RLTS.T30416A9546843.en. Downloaded on 04 January 2017. 3) Miller, A.G. “Completed data collection forms and comments concerning the threatened trees of Socotra and Yemen.” 1997. 4) Botting, Douglas. “Island of the Dragon’s Blood. London: Hodder and Stoughton”, 1958. 5) Oldfield, S., Lusty, C. and MacKinven, A. (compilers). “The World List of Threatened Trees.” World Conservation Press, Cambridge, UK. 1998. 7) LVONČÍK SMUEL, MADĚRA PETR, VOLAŘÍK DANIEL, VRŠKOVÝ BORIS, HABROVÁ HANA “FIRST PROPOSAL OF SEED REGIONS FOR FRANKINCENSE TREES (BOSWELLIA SPP.) 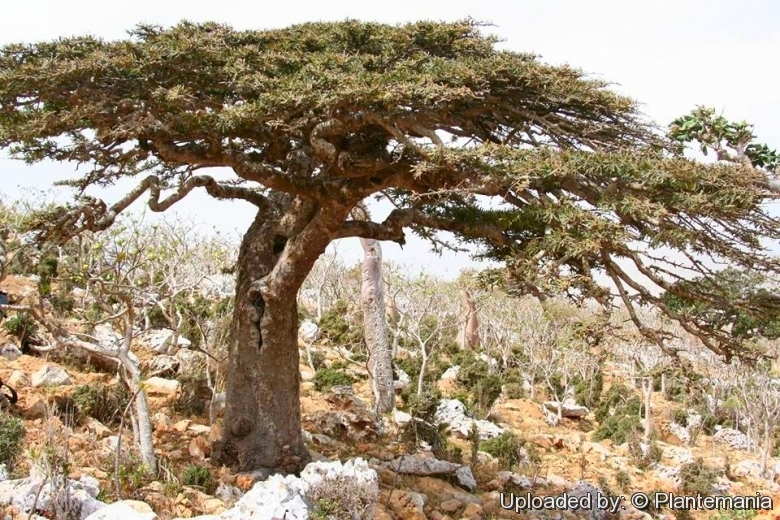 ON SOCOTRA ISLAND” Journal of Landscape Ecology (2013), Vol: 6 / No. 3. 9) Moser, Charles K. "The isle of frankincense." National Geographic Magazine, Volume 33 (March 1918): 267-278. Cultivation and Propagation: The Socotran Frankincense Tree (Boswellia socotrana) is a favorite bonsai species amongst bonsai enthusiasts. It is a slow-growing species and plants are sensitive to frost. Socotran Frankincense Trees are accustomed to high heat, intense light and low humidity and moisture in their native habitats. But what they are familiar with in the wild does not have to be carried out to the letter in cultivation. In fact, they particularly will appreciate not having to experience extended, extreme drought as long as they do not end up the waterlogged victim of fungal root rot. Quite easily actually, and strangely enough, they are killed more from love than neglect. Over-watering in winter is probably the biggest cause of death with this species. They have very soft wood and if it receives too much water in the dry months can quite easily rot. It does not put out a deep taproot but develops a good network of smaller roots and can be planted in quite shallow pots. From a bonsai point of view, another very desirable feature of this species is its ability to heal from quite drastic surgery. Uses: The oleogum resin is locally harvested and burned as incense.